Two condos at the high end Wilshire Corridor building, The Remington (10727 Wilshire Blvd), received price reductions in the past week. Today unit #403 received a 4.52% or $61,000, down to $1,289,000. According to the MLS, the unit is a 2 bed / 2.5 bath with 1,745 sq ft of living space. #403 is the N/W corner, which faces off of Wilshire. This is the first reduction after 88 days on the market. Last week unit #905 made its 2nd price reduction of the listing term with a 2.47% or $30,000 reduction, down to $1,185,000. This is the least expensive condo for sale in the building. 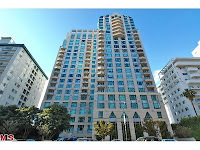 According to the MLS, the unit is a 2 bedroom / 2 bath, 1,697 sq ft and faces south onto Wilshire. 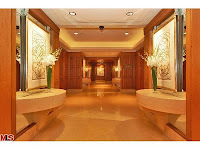 Currently there are two units in escrow in the building and the last condo that closed in the building sold on the 4th floor on 10/30/09 for $1,240,000.Additionally, there are 9 total active units in the building ranging from $1,185,000 for the above mentioned #905 up to $7,995,000 for PH2. The average asking price of the 9 units is $2,780,556. Excluding the penthouse unit, the average price for the remaining 8 units is still over $2m at $2,128,750. The Remington, completed in 2002, is rated by most as one of the top 5 buildings on the Wilshire Corridor with its luxurious white glove service and amenities; Valet service, door man, concierge, abundant staff, on site management, sitting room, banquet room, pool, gym, wine lockers, extra storage, direct elevators into your unit and more.